You may remember a couple weeks ago, when I shared a recipe for a Caramel Apple Cake, which I’d found in the Food Network magazine. I baked the cake for the dessert table at my little guy’s birthday party. 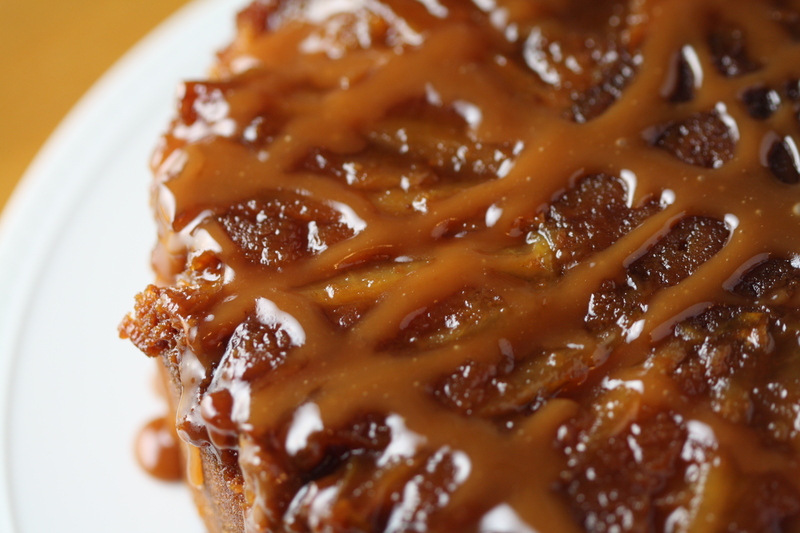 In theory, the cake was inspired genius; the gooey, fruity top of an upside-down cake; oozing with homemade caramel. In execution, it was less than perfect. While the cake up near the apples and caramel was sweet and tender, the bulk of the cake struck me as a bit too dry and bland. But the idea was too good to let go. So, I reworked the recipe a bit. 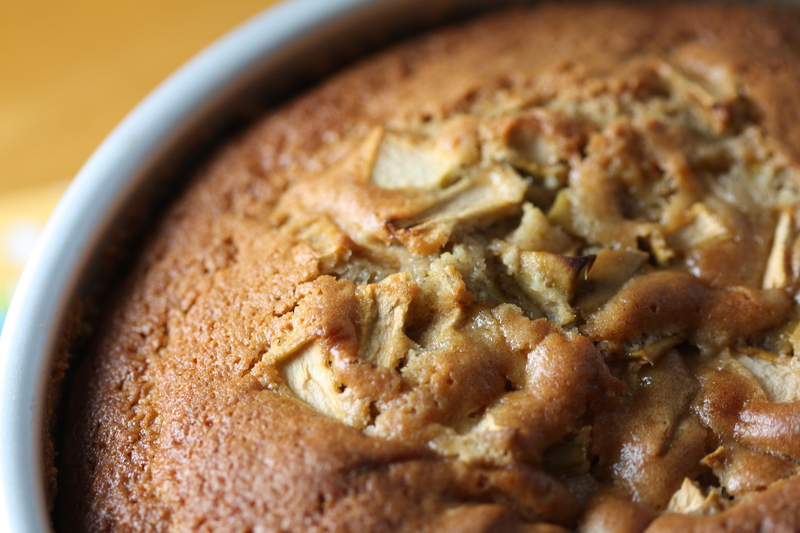 The result was a definite winner; a better Caramel Apple Cake. I don’t want to insist that you ignore the Food Network on this one and listen to little ol’ me. But, well… Listen to me! My adjustments are as follows. I reduced the amount of flour and increased the cinnamon. I halved the entire caramel recipe since, as written, it produces WAY more caramel than necessary. I eliminated the center apple, which seemed unnecessary and did little for the finished appearance. Finally, borrowing the idea from my favorite, super-moist chocolate cake recipe, I added 2/3 cup of boiling water to thin out the batter. The result was a significantly moister, more flavorful cake with less fat and calories than the original! An all-around win! Butter a 3 inch deep, 8 or 9 inch diameter cake pan. Prepare the Caramel. In a deep saucepan over medium-medium/high heat, combine the sugar and corn syrup until the sugar melts and the mixture turns a deep amber color. Be careful, because the mixture will be extremely hot. Turn down the heat to medium and carefully add the butter and cream. Be prepared that the mixture will bubble up vigorously. Stir with a long-handled spoon for about 3 minutes, until combined. Allow the caramel to cool for a minute. Reserve 1/2 cup of the caramel in a container. Pour the remaining caramel into the cake pan. Allow the caramel to set for 20-30 minutes. Slice both apples into thin pieces. 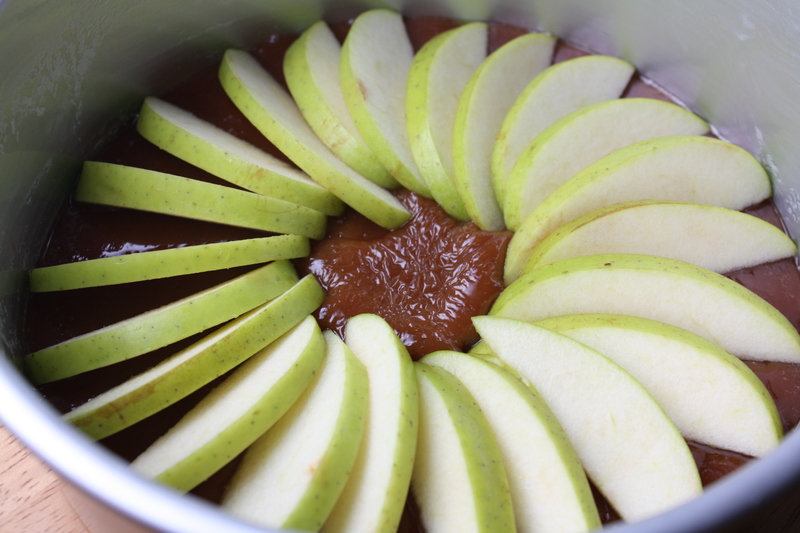 When the caramel has cooled, arrange the apple slices in an overlapping ring around the edge of the cake pan. Chop up the remaining apple slices and set aside. 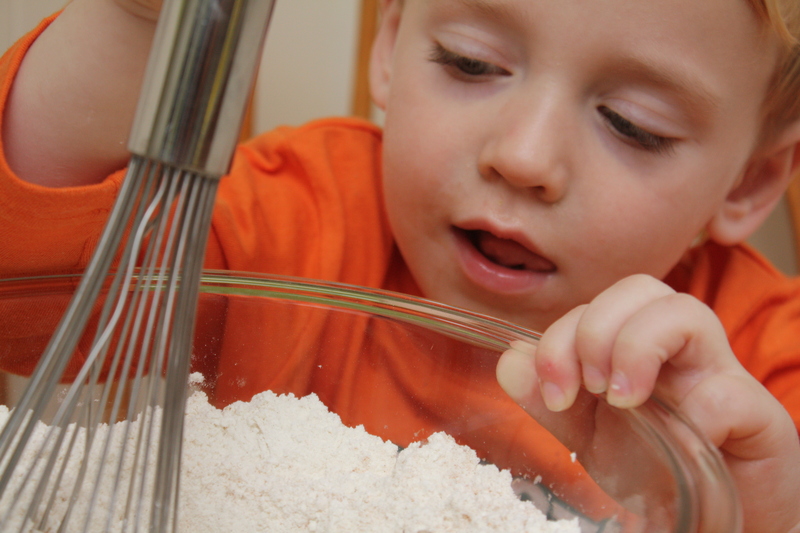 Mix together the flour, baking powder, baking soda, salt and cinnamon. Set aside. 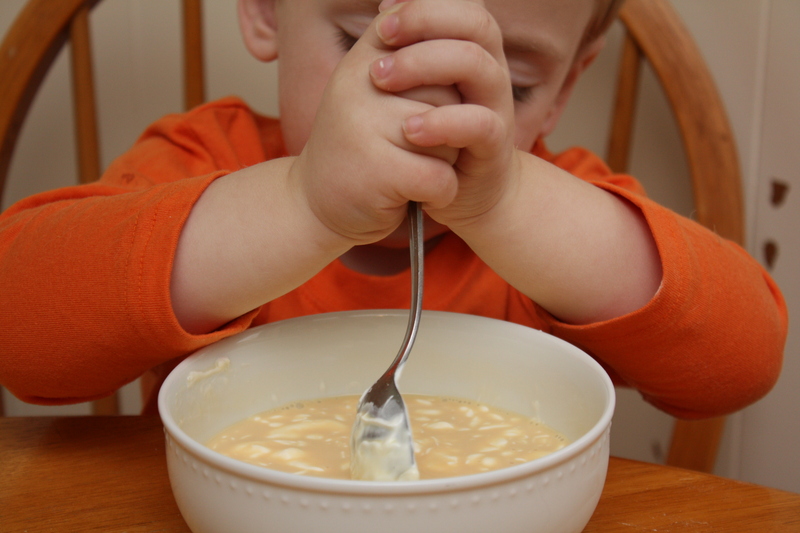 In a separate small bowl, mix together the sour cream, orange juice, and vanilla. Set aside. Use a hand mixer to beat together the butter and sugar until light and fluffy. One at a time, beat in the eggs. Then, add half of the flour mixture, followed by half of the sour cream mixture. Continue beating to combine. Add the remaining half of the flour mixture and remaining sour cream. Beat until combined. Stir in the 2/3 cup of boiling water, until the batter is smooth. Pour the batter into the pan. Sprinkle the top of the batter with the chopped apples. Bake for about 1 hour and 20 minutes, until the top is golden brown and the cake springs back when gently pressed. Cool completely in the pan. To serve, bring about an inch of water to a boil in a large saucepan or skillet (with a wider diameter than the cake pan). Turn off the heat and place the bottom of the cake pan in the hot water. Allow the pan to sit in the hot water for 5-7 minutes to soften the caramel. Then, run a knife along he edges of the cake to loosen and invert the cake over your serving plate. Microwave the caramel for a few seconds at a time until it is softened. 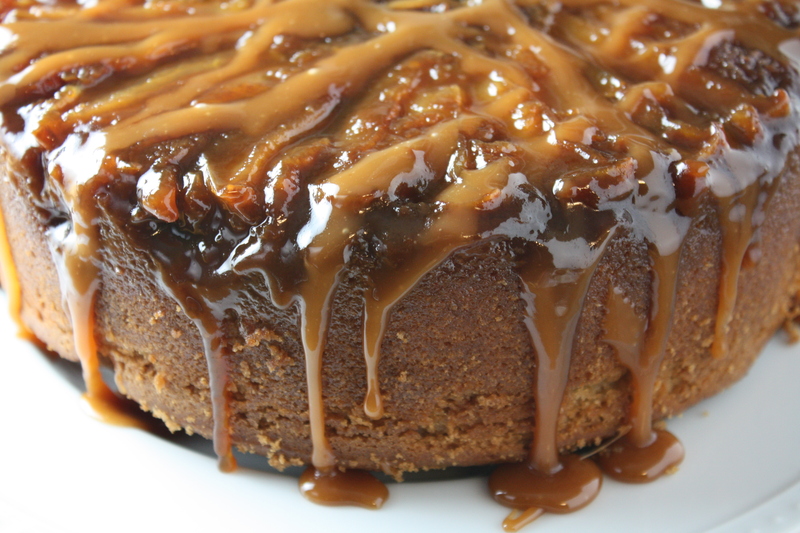 Drizzle the remaining caramel over the top of the cake. Serve immediately. Posted in Baking, Cakes, Cooking with Kids, Desserts, Food, Fruit, Recipes and tagged apples, autumn, baking, cake, Cooking, cooking with kids, dessert, fall, Food, food photography, kids, Recipes. Bookmark the permalink. This cake looks absolutely amazing. I already knew of course that caramel and apples are a match made in heaven (Tarte Tatin, yum) but this looks so… so… And you’re right, it really does look amazingly moist! I can’t wait to try the recipe out (I might even try putting a bit of caramel in the actual pastry). Biggest challenge will undoubtedly be converting all those american units into metric or ounces. Well done on adapting the recipe – it sounds super duper yummy. This cake looks delicious and I love all the photos! Will definitely make this! Love the pic of your little helper! My son will love this one!! Congrats on the well deserved Top 9! OH YUM, I would have love to have to see a slice, I bet it is lovely! I am having my college friends over on Wednesday and I am making this for sure! Wow! This cake looks awesome. I would have never thought to do this. It’s a great upside down cake recipe for the fall. I will most definitely be making this at some point in the next month or two! Wow…looks yummy! I would definitely try out this well-tuned version! I just made this , with a few adjustments. It’s hard to get corn syrup here so I used treacle for toffee rather than caramel, and did it in a loaf tin. Most impressed! Thanks for the recipe!! I am thinking of entering this cake into a contest at our local Pumpkin Party, Oct 1, 2011. Wondering though, if it needs to be served immediately, will the caramel be too firm after a couple of hours? Sorry for the delay in replying! This is such a delicious cake! The caramel will firm up a bit, but it’s been a while since I made this cake and I can’t remember exactly how firm it got. 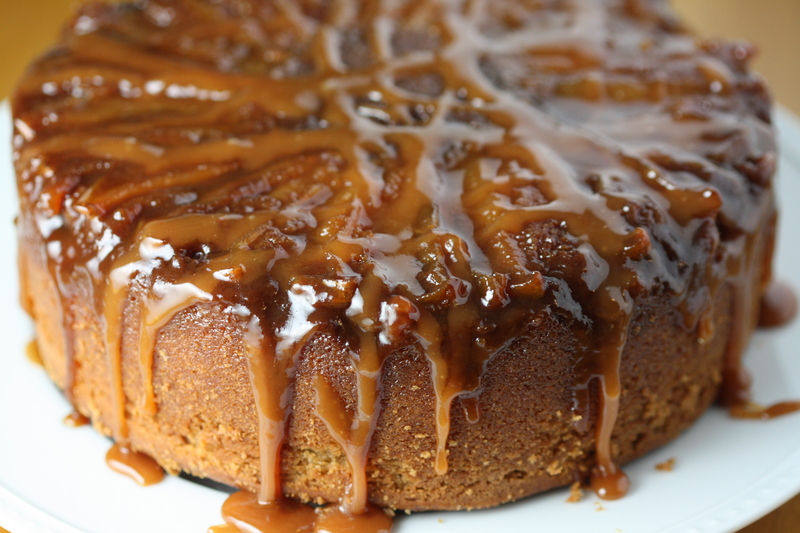 You can bake the cake several hours ahead of time, but does best if you wait to soften the caramel (by placing the pan in a dish of hot water), plate the cake, and drizzle the warm caramel over it near to serving. I think it should stay pretty soft for a while at room temperature. I served the cake at one of my son’s birthday parties and I don’t remember needing to microwave it to enjoy the leftovers! Hope that helps! Good luck if you decide to enter it in the contest! Let me know how it goes! I found your recipe after an exhaustive online search for a caramel apple cake recipe. I made it today for a Rosh Hashanah dinner. It turned out beautifully and everyone LOVED it. I served it with vanilla ice cream and it was to-die-for! Ooey gooey topping and super moist flavorful cake. Thanks so much for sharing this recipe, which I’m sure will be requested for many future holiday dinners!